Designed to provide quick, safe assistance to those who have trouble standing, the heavy-gauge steel construction and lower base height maximize stability. 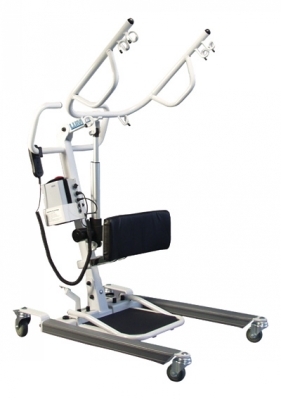 Unique, ergonomic foot pedal base opening; large, easy-to-grip handles, adjustable knee pad unit, 24V DC motor allows quiet, smooth operation. Maximum weight limit 400 lbs.